It’s been almost five months since I harvested the Elephant Heart plums, September 18, 2012 to be exact. It wasn’t much of a harvest, often times it isn’t with this variety, for us anyway. We have three big mature trees that usually bloom prolifically but more often then not, just don’t set fruit. We’ve planted a few more varieties of Japanese plums to help with the pollination (Plums can be fickle this way) and when the weather is conducive to bees getting out and visiting the flowers, we have gotten good crops from these trees. The weather is a huge factor here too (as with most everything), it’s often windy, cold and rainy in the spring, so bees don’t have a chance to get out and do what they do. Other plums we have seem to never have an issue with setting fruit; Santa Rosa, Shiro, Burbank, all pretty much bloom around the same time and are consistent bearers. The Elephant heart is one of a few varieties we grow that customers ask us about when we get back to the markets in July, months before they’re ready, a favorite. 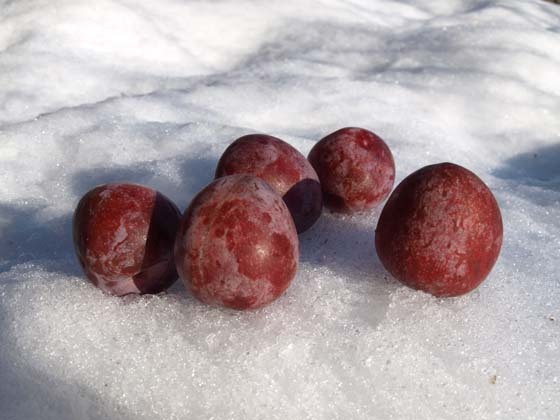 Elephant Heart Plums, in January ! You might be wondering why I’ve chosen now to write about this illustrious fruit now? As I mentioned above, we didn’t get much of a harvest last fall, but we did get about a box (20+ pounds or so) which we kept for ourselves, and I’ve been eating them with my breakfast since, one or two every day. I just ate the last ones today; January 14, 2013, no foolin’! Not all were in great shape, they begin to break down with browning around the pit spreading to the skin, some of ours had browned a little, but still good to eat. Thats right, FIVE months since harvest, for a soft fruit! I wouldn’t attempt to market them this late, but to know they can last this long is a revelation to me. The longest we’ve kept them before was to just after the Thanksgiving holiday (late november) and then to just before Christmas, but into January now. Our method of storage is that I turn off the refrigerator unit in our walk in cooler when it gets cold out (November) and use the cold outside air to cool it, basically a refrigerator. This coming season, if we get any to set, I’d like to pick some a week or ten days before when I usually harvest them and see if they last any longer or hold up better in storage, and if they’ll ripen. It’s a bit of balancing act with fruit harvests, when a variety is destined for a long term storage it gets picked sooner then if the fruit is intended for immediate consumption, but care must be taken to make sure the fruit is ripe enough to mature when taken out of storage and also not to pick it too ripe off the tree and too far along the ripeness spectrum as to be past prime. (Ever had a peach from the grocery store that never get sweet or ripen properly, they were picked to soon. Conversely, if you leave a peach on the tree just past it’s optimum picking window, it gets mealy and loses sweetness ) And of course it varies dramatically from fruit to fruit and also from variety to variety within the same fruit. 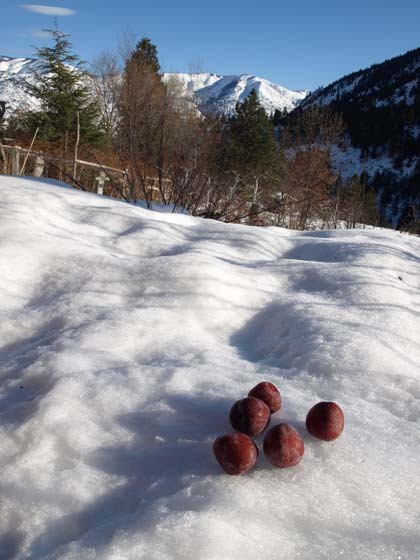 But, Japanese plums in January that weren’t shipped halfway around the world, Yeah! !